Your class lesson, that is, with the Markers Dry Erase. You already know about our highly durable porcelain steel constructed markerboards and how they provide years of use. However, most teachers are unaware of how easy it is to wipe the melamine surfaces clean. Part of the reason for the ease of cleaning lies with the board surfaces themselves, but another factor that makes it easy to start new lessons with one swipe of a cloth are the markers. 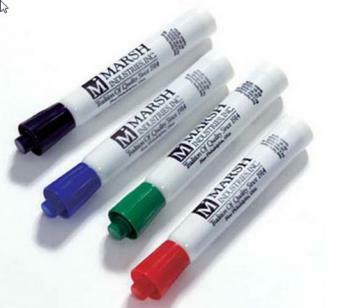 The Markers Dry Erase present clear, bold images for students to easily see, while not leaving lasting blurs or spots. You do not have to worry about the noxious fumes that emanate from other types of markers, as this set of 12 black markers barely leave a scent.